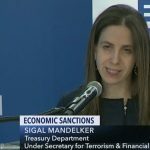 The U.S. Treasury Department’s Undersecretary for Terrorism and Financial Intelligence, Sigal Mandelker describes how the Iranian regime finances unethical activities at home and abroad. 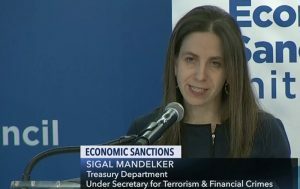 On Tuesday, June 5th, the U.S. Treasury Department’s Undersecretary for Terrorism and Financial Intelligence, Sigal Mandelker, gave a speech to the Foundation for Defense of Democracies. The Washington, D.C.-based think tank asked Ms. Mandelker to describe how the Iranian regime finances unethical activities at home and abroad. According to Mandelker, the Iranian regime has consistently supported terrorism, destabilized the Middle East, and carried out human rights abuses against its own people, even while the Iran nuclear deal, signed in 2015, was in effect. The MEK had stated from its inception, that the deal was weak and ineffective. Ms. Mandelker appealed to the global conscience of democratic nations when she said that Tehran exploits “the global financial system, as well as country after country around the world” to finance its activities. She warned that these countries might become an unwitting accomplice to Iranian atrocities by allowing their national wealth to be used by the regime.